In today's world, individuals travel the country and the world in search of medical procedures. Usually, they seek medical care that is cheaper. But sometimes, they seek the services of renowned, supremely skilled surgeons. Cosmetic (or plastic) surgery is intended to make the patient look more attractive or younger. Since cosmetic surgeons' work is visible to the world, these doctors are chosen carefully by prospective patients. Many upscale patients are willing to travel for aesthetic medical tourism. They seek elite cosmetic surgeons in posh locales like Beverly Hills and New York City. The most skilled of these doctors enjoy worldwide renown and a very select, celebrity-heavy clientele. These exclusive surgeons understand that these patients have a strong desire and substantial means to make themselves more attractive and their lifestyle more enjoyable. Cosmetic surgery is a regular component of their lives. Accordingly, some enterprising cosmetic surgeons have started packaging their surgical services very like luxury travel spa vacations. Meet Dr. Sam Rizk, NYC Cosmetic Surgeon and Tourism Attraction! Dr. Samiel "Sam" Rizk, M.D., F.A.C.S. is a super-high-end New York City cosmetic surgeon. His office and private surgical facility are on prestigious Park Avenue in Manhattan's Upper East Side. Dr. Rizk's office is filled with famous fashion photographs (the originals). And his patients are some of the world's wealthiest or best-known individuals. 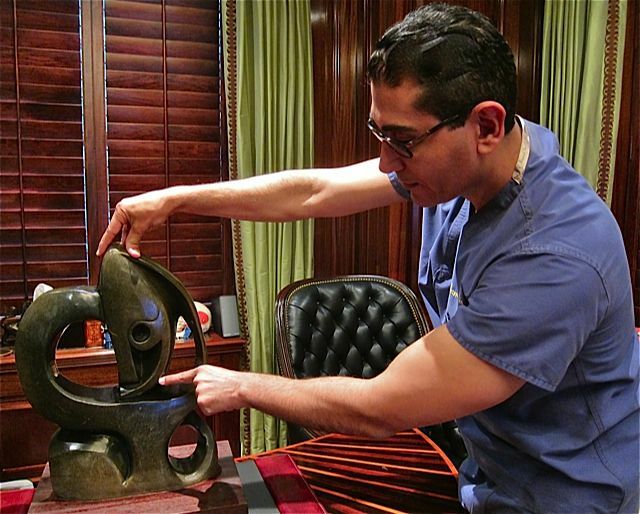 However, Dr. Rizk's medical stature equals the extreme glamour of his patients. He is double board-certified and an innovator who has pioneered surgical techniques with natural-looking results and shortened healing time. This surgeon is a specialist who performs only facial procedures. His repertoire: rhinoplasty ("nose jobs") and lifts: face, neck, eye, and brow. Dr. Rizk understands that cosmetic surgery is a lifestyle choice, and that his patients are also luxury travelers who are used to luxury getaways in New York City. Dr. Rizk told me, "Cosmetic enhancements are part of the luxury lifestyle. Everybody wants to look young. Those who can afford it do so." "My practice is in Manhattan," he said. "So why shouldn't my patients have a great New York experience -- a New York beauty vacation -- while they're here for their surgery?" Dr. Rizk's patients have the option to turn their surgical experience into a deluxe New York visit. • Dr. Rizk visits his patients in their hotel suites for checkups and bandage removal. "It used to be called 'house call,' he said. "I make hotel calls." Within a few as two days after surgery, many patients are out of bandages and ready to enjoy New York as visitors. "In fact, most of my patients stay on for a Manhattan vacation," says Dr. Rizk. "With their younger, prettier, or handsomer face." Please note: the Luxury TravelExpert received no services nor advice from Dr. Sam Rizk. This article does not aim to advocate his medical services, but to provide a trusted example of high-end medical tourism.